Saint and Colts in the Superbowl, so let’s talk Favre? 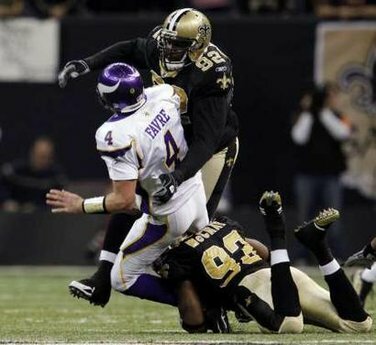 Just finished watching the NFC throw down between the Saints and Vikings. Good game that went into over time. The Vikings lost the game I think just as much as the Saints won it. Fumbles and interceptions were everywhere. I was watching the post game breakdown on EPSN and after the initial highlights of the game, where do the sportscasters go to? “Will Brett Favre retire or not.” Way to steal the spotlight from the Saints and waste it on a question that no one will know the answer for another 6-7 months. You just had to be the first one to ask didn’t you. Just goes to show you that we are a drama driven society. We can’t enjoy our day without a little bit of drama. In the post-game interview with Favre it was only about 4-5 questions into the interview and someone asks him if he will retire. His answer was just to talk it over with the family and then make a decesion. I will have a poll up soon where you can make your prediction on who will win the Superbowl, but one thing I won’t have is a poll about whether or not Brett Favre will retire or not. So you will have to rely on the folks at ESPN for your poll results about. They probably have a poll up now! This entry was posted on Sunday, January 24th, 2010 at 11:30 pm and is filed under In The News. You can follow any responses to this entry through the RSS 2.0 feed. You can leave a response, or trackback from your own site.